Dynamic tests of MinC and its effect of bacterial growth was preformed by means of OD measurement only. 50 μl of over-night cultures of pSB1A2-pT7-B0032-MinC and pSB1A2-MinC were used to inoculaet 3 50 ml flasks of LB (+amp,+cm) medium (one with pSB1A2-MinC and other two with pSB1A2-pT7-B0032-MinC). 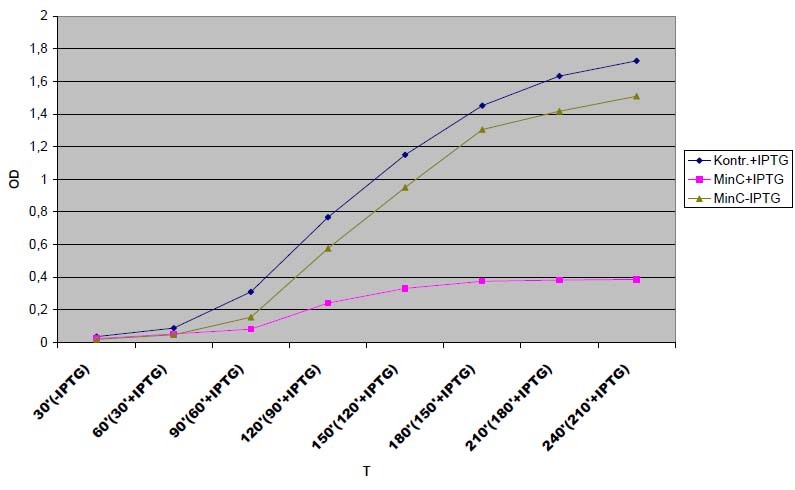 Cultures were induced with 10 μM of IPTG following initial incubation of 30'. OD was measured every 30 minutes. Results are shown on the plot below. These initial mesurements show a clear influence of MinC on bacterial growth. Discrepancies between Kontr.+IPTG and MinC-IPTG cam bei either due to leaky promoter or differences in initial OD. This measurement will be repeated more precisely, with both OD and CFU taken into account.